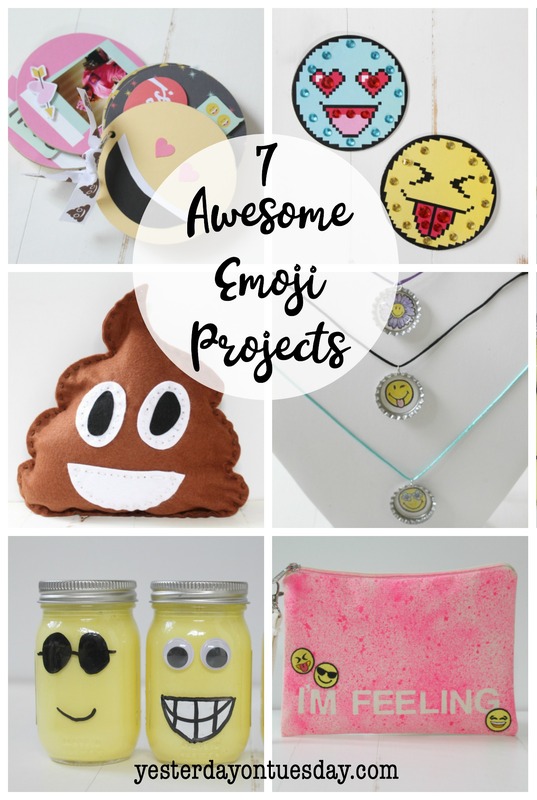 These 7 Awesome Emoji Projects are sure to make you smile or LOL! You can catch a live demo on KOMO-TV 4 on June 12th at 4:00. There’s a movie coming out about emoji in a few weeks… but even without it, it’s almost hard to remember what we did before we had all emoji at out fingertips to communicate a though or mood in a single symbol! BTW, your source for all things emoji and crafty is Ben Franklin Crafts and Frames in Redmond. 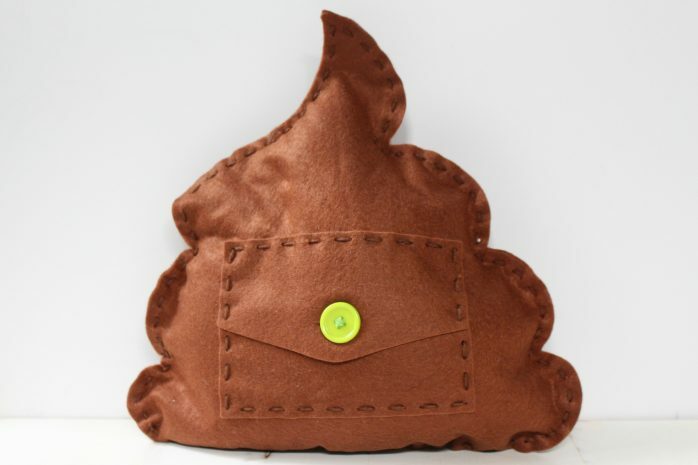 Send your kiddo to school this fall with a super cool Emoji Bag to store their pens and pencils… no sewing involved! Supplies: Tulip Fabric Spray Paint in Neon Pink, small canvas bag, vinyl letter stickers (these are 1″ big), and Iron On Stick On Emoji’s by Joy (found in the sewing department). Note: Put a large plastic bag on your work space. 1. Add some cardboard to the pencil pouch so the color doesn’t bleed through. 2. Add letter stickers (you are making a resist for the paint). 3. Spray the paint on and let it dry for at least 4 hours. 4. Remove the letter stickers and add the emoji stickers. All the fabric, thread, needle and accessories are inside. It’s very cute– check out the back! What a fun project for a group– this would be awesome for a birthday party activity or for a craft fair. Supplies: Stampo Smiley World stamps, black stamp pad, colored pencils, bottle caps, epoxy dots, white scrapbook paper, craft glue, cords, 2″ circle punch, jump rings and small hole punch. 1. Stamp the faces on the paper. 2. Color them in with colored pencils. 3. Punch them out with the circle punch. 4. Glue the circles to the bottle caps. 5. Add the epoxy dots. 6. Punch a small hole in top and add a jump ring. 7. Loop cord through jump ring. Kids will have a blast making this non Borax slime recipe and then decorating the bottles! Supplies: Mini Ball Canning Mason Jar, 4 oz glue, 2 oz liquid starch (you need half as much liquid starch as glue), yellow food coloring. To make the faces, you’ll need paint makers, google eyes and glue. 1. Mix the food coloring into the glue. 2. Add the liquid starch. Note: gradually add the liquid starch in, and put it in different places, continuously mixing. Then “work” the mixture until it’s consistency is like the slime in the photo. 3. 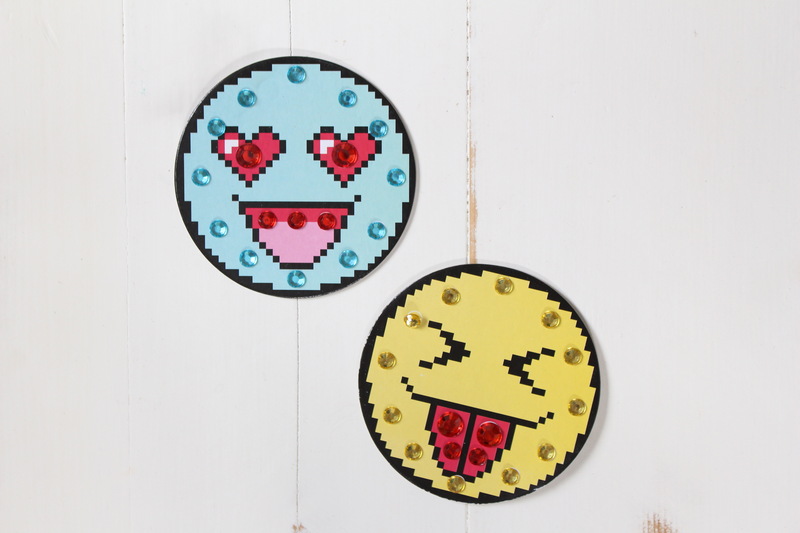 Make emoji faces with googly eyes, craft glue and paint markers. 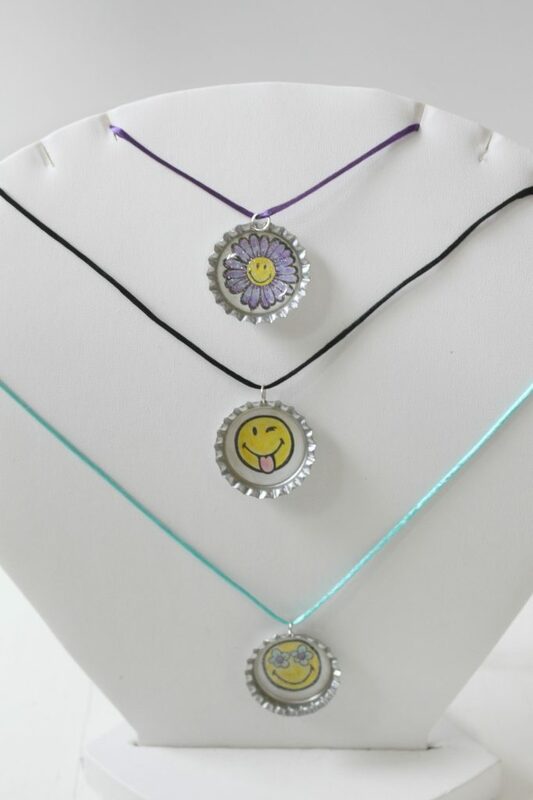 This Smiley Faces Craft Kit is cool for younger kids, starting at six years old! Everything they need is contained in the kit. Teens can make this mini emoji scrapbook with their Instagram photos! Supplies: Circle Chipboard Scrapbook, a couple binder rings, fun ribbon, paper glue, scissors hole punch, and the Emoji Love Kit from Simple Stories. Yellow, black and white scrapbook paper is also good to have on hand to make the cover as shown. 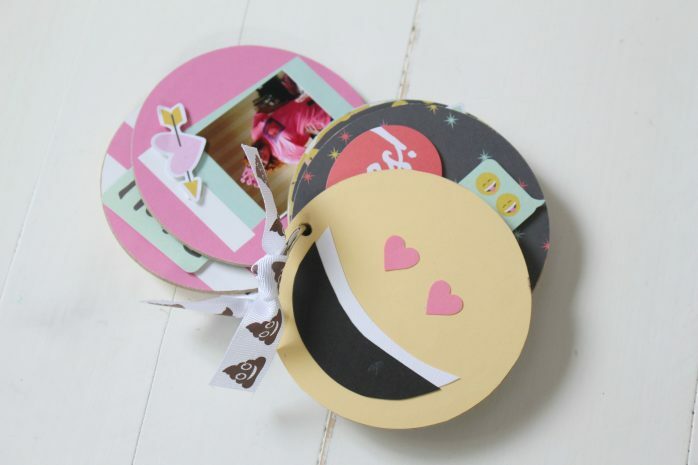 Directions: Use the scrapbook paper and shapes in the kit to embellish the scrapbook. Punch holes in the corner of the chipboard circles and add jump rings. Then the fun part– glue in photos. How sweet is this Emoji Frame? Plus it’s a cinch to make! 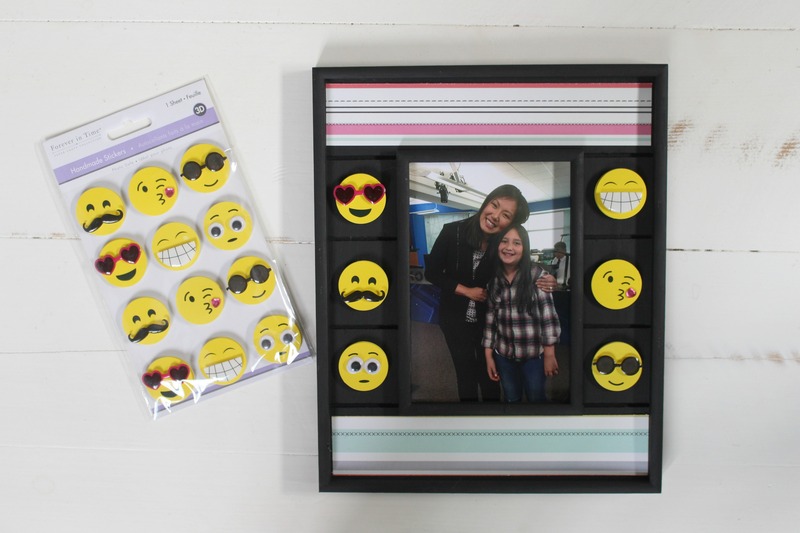 Supplies: plain wood frame, black acrylic paint, emoji stickers, scrapbook paper, scissors and glue. Directions: Paint the frame black. Add the scrapbook paper with glue. Place stickers on frame. 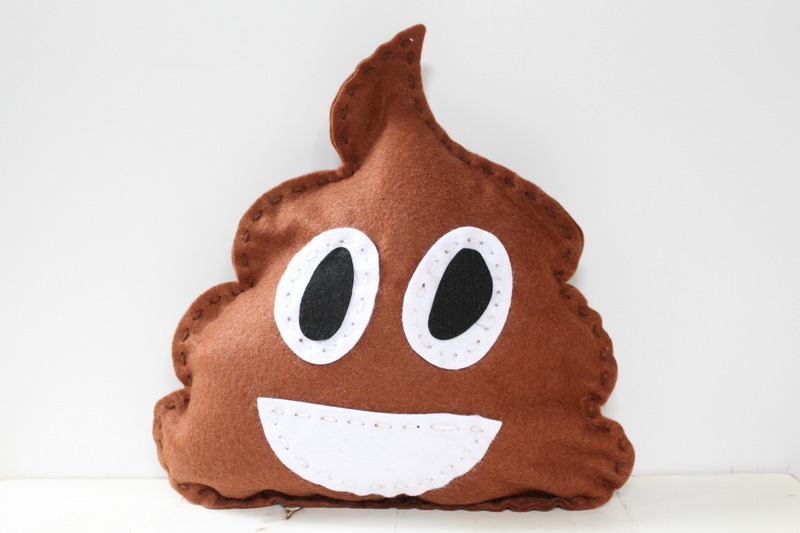 I hope these Awesome Emoji Projects make you smile! LOVE the stuff you can find at Ben Franklin? 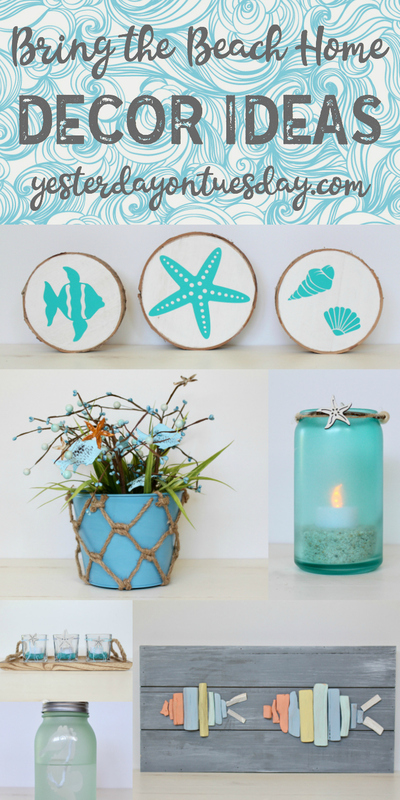 Check out these Bring the Beach Home Decor Ideas! I can’t believe there’s an emoji movie. I think my kids would love the slime recipe the most. These are so cute. 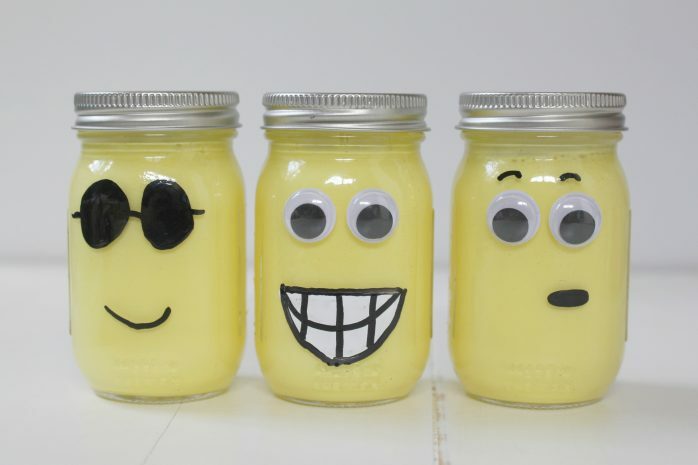 I absolutely adore the emoji jars! Very cute! I have an 8 year old daughter (for whatever reason) absolutely loves emojis. She\’d love some of these crafts, esp. the cute little bag. Visiting from BFF party.